“Taking It One Step Further” builds on the foundation of the successful workshop “Painting From The Inside Out”. Sometimes, as painters the work we do just doesn’t make it, or just isn’t right. The painting doesn’t have the magic or sparkle we intended. “Taking It One Step Further” is about corrections, responding to the actual, and making it right. This is an intensive and vigorous two day workshop. 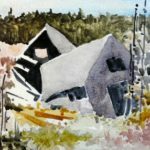 Wayne Boucher works one on one with each artist and leads a group critique daily to provide a forum for constructive evaluation and progress. Also, artists will be asked to express an idea through their choice of painting medium. Participants will be asked to explore approaches to painting and presentation, use of materials, tools, critical thinking, manners and methods of expression and signification, editing and processes of application in formulating meaning through paint. The objective of the workshop, through preliminary explorations and studies is to create a responsive dialogue between the artist and their paintings in bringing essential elements of signification and process into a final work(s). Participants are encouraged to bring a work that didn’t quite make it. I cannot thank you enough for opening your studio doors and letting us have 4 days of you. 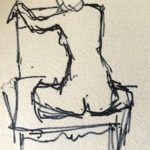 The sharing of your experience and personal painting process; painting tips, techniques and tricks; one-on-one attention and group critiques were so extremely helpful to me. The workshop was exactly what we were looking for and much more!!! 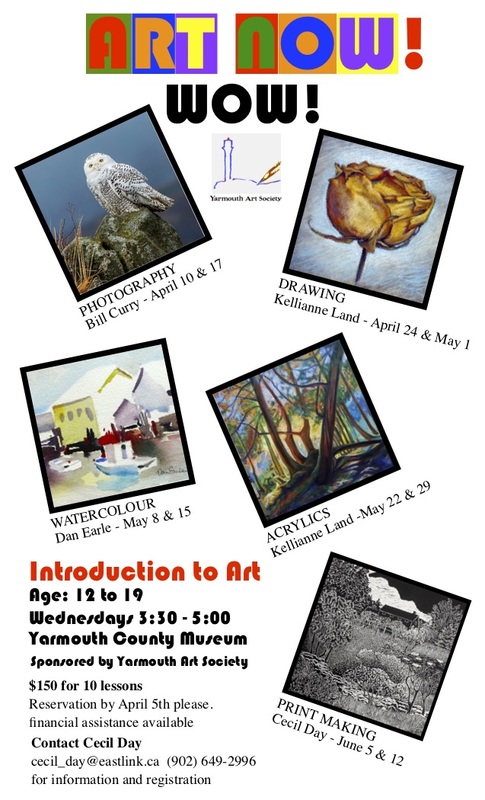 To register for ARCAC Workshop please call 902-532-7059. Deadline for registration is March 25. Please bring your own materials (some available) bring a lunch, light snacks, tea & coffee provided. The workshop will cover all painting mediums, and will focus on the use of acrylics and oil sticks. Artist participants should use and bring art materials they are familiar with. Also, artists are requested to bring 6 to 10 canvases, and drawing papers to the workshop. The theme of windows for this project takes its inspiration from Maud Lewis and the brightly coloured flowers she painted on her window panes. This theme was chosen to align with the goal of this project, connecting seniors to the wider community through arts-related activities. Just as a window both lets someone see out and lets illuminating light into a building, art can serve as both as a way for an individual to look into their own life and experiences as well as, through the presentation to the wider community, be seen by those who view the finished artwork. Maud’s windows brightened her view on the world and let people going by glimpse the work of the artist who lived there. The works on display here are the result of a number of workshops and events that occurred over the last year. These activities often had participants drawing upon their own memories and experiences as the basis for the works that were created. Come view the results, have some refreshments, and learn about upcoming public workshop opportunities. This project funded in part by the Government of Canada’s New Horizons for Seniors Program. for a evening of exploration. We are pleased to have Mi’kmaq Elder Marilyn Francis from Acadia First Nation in Yarmouth, with us to share her wisdom and to help you explore your animal spirit of creativity. Marilyn will teach you about animal names in the Mi’kmaw language. Experience this introduction to the language while painting your own animal flash cards. 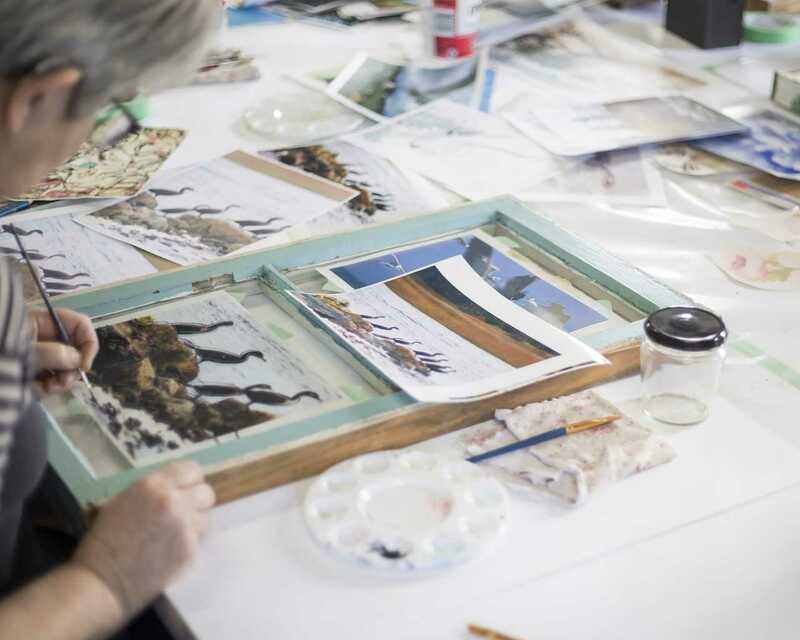 The workshop is inspired by the Terroir exhibition which presents art inspired by the environment. Artist Alan Syliboy’s book, Mi’kmaw Waisisk, will also provide inspiration for the afternoon. Family Sunday is a time to enjoy working together. All materials are provided. Children 5-12 years of age, with their parents, grandparents or caregivers. Parents must stay with the children. Members free, general admission applies to non-members. Thank you to the Friends of the Gallery for their continued support. 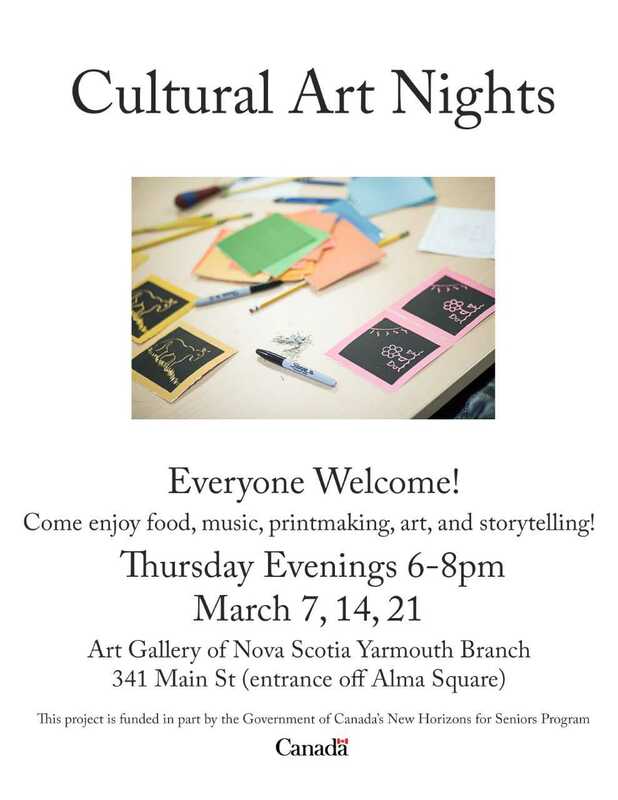 The Friends of the Art Gallery of Nova Scotia in Yarmouth are pleased to present a Maud Lewis Story Circle in honour of Maud Lewis as part of Nova Scotia’s Heritage Day. 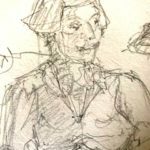 The program will include a Show & Tell circle where a dozen people will share personal stories related to meeting Maud, being inspired by Maud, or having information regarding Maud. 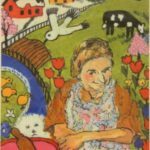 The audience will also be asked to bring items of interest related to Maud Lewis, and to share their stories. This is a free event funded in part by the Government of Canada’s New Horizons for Seniors Program. Click on Members Art just below the masthead picture to see our new page. We are making progress in its development after just two days. This is a spot where people who are YAS Members can display their art. 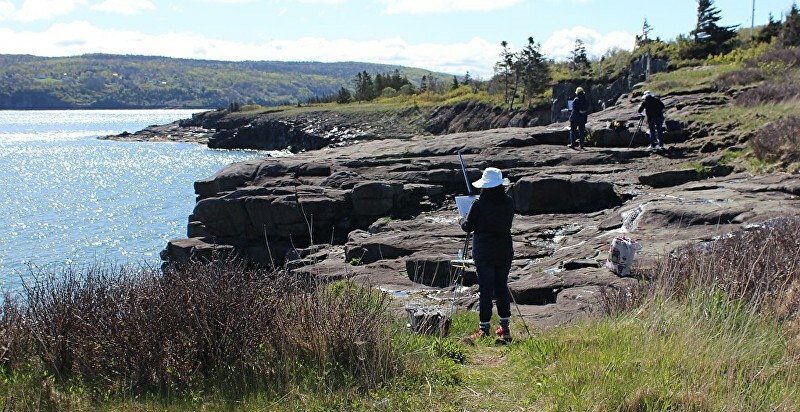 Poppy Balser, watercolour artist from Digby, will be teaching two courses this spring. Many YAS members have enjoyed working with her in the past. Her classes are always enjoyable and full of good lessons you can apply. We would like to suggest that you subscribe to our YAS website to get notice of all new posts. See box on left. 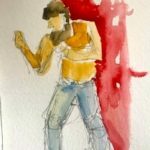 This blog is the location where we announce meetings, shows and events that may be of interest to art enthusiasts. We also encourage you to join the art society to show your support of visual arts in our region. See Membership Page (above) to get details.